This article is about the hold. For the city, see Whiterun. 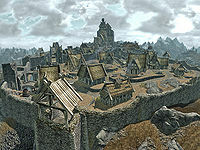 Whiterun Hold is a hold in central Skyrim, with its capital in Whiterun. It is initially neutral in Skyrim's Civil War, but both sides are actively competing to gain control of Whiterun. As a result, it is the site of the first battle of the war, Battle for Whiterun (Imperial or Stormcloaks). The Imperial Legion will secure the allegiance of the incumbent Jarl Balgruuf, who seeks reinforcements in the face of an imminent Stormcloak siege, and Balgruuf's government, now aligned with the Empire, will accordingly remain in control of the hold should the Imperial Legion successfully defend the city; otherwise, the victorious Stormcloaks will put Vignar Gray-Mane in power. The hold borders six of the other eight holds in Skyrim, all but Winterhold and Haafingar. 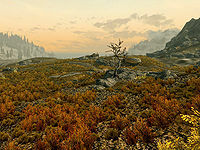 Whiterun Hold is mostly covered in tundra and bordered by two major rivers—the White River to the south, and the River Hjaal to the north—which makes the land fertile and well suited to farming. The tundra is home to all manner of animals and creatures, from the large—giants and mammoths—to the small—foxes and goats. The White River, flowing down from Lake Ilinalta, is home to a large population of salmon. The tundra is rich in lavender, tundra cotton and butterflies. At night the butterflies are replaced by torchbugs and luna moths. Another location of interest is Riverwood, where the pine forest stretching up from Falkreath Hold takes by. Here are forest plants like mora tapinella and thistle more common than on the tundra. All types of mountain flowers, except the yellow variant, can be found throughout the hold. The frail red variant however seems to thrive best around the rivers by Whiterun. The snowy parts, like Throat of the World, are only home to the humble snowberry. As the central hold in Skyrim, its main roads are in good condition, but a few of the more remote roads are not as well maintained. There are main roads heading southward to Falkreath Hold through Riverwood and Helgen, eastward into Eastmarch and the Rift, northward to Hjaalmarch, and westward to Haafingar through Rorikstead, and to the Reach. Travelers should be encouraged to see that the main roads are regularly patrolled by Whiterun Guards. 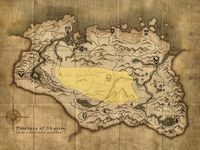 All locations in Whiterun Hold with individual map markers are listed. There are a few places without map markers listed for their significance. †Technically located in the Reach. There are four Dragon Mounds in Whiterun Hold. Northwest of Bloated Man's Grotto. There are two Shrines in Whiterun Hold. A Shrine of Stendarr south of Swindler's Den. A Shrine of Talos southeast of Shimmermist Cave. Southeast of Sleeping Tree Camp are three Stone Totems which unlock a gate with a skeleton and a chest. Unbound: Escape Imperial custody and a dragon attack. Before the Storm: Inform the Jarl of Whiterun about the dragon attack on Helgen. The World-Eater's Eyrie: Battle through Skuldafn Temple to reach Alduin's portal to Sovngarde. Destruction Ritual Spell: Learn the most powerful Destruction spells Skyrim has to offer. A Night To Remember: Find your lost friend, Sam, as you recover from a bad hangover. Kyne's Sacred Trials: Participate in Kyne's Sacred Trials by hunting the guardian beasts of Skyrim. Kill Anoriath: Assassinate Anoriath to complete a Dark Brotherhood contract. Take the Hidden Treasure: Torture the Brotherhood's prisoners for treasure. Imitation Amnesty: Help get a convicted prisoner released from jail. The Golden Claw: A shopkeeper wants you to retrieve his family heirloom from a bandit. In addition, many miscellaneous quests are located in Whiterun Hold. They are listed here. This page was last modified on 7 January 2019, at 21:47.